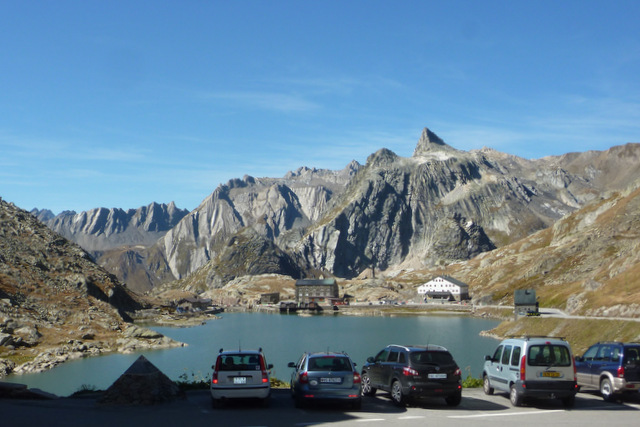 The Saint Bernard Pass is one of the main routes from Western Switzerland to Italy. The road to it starts at Martigny, travels through the Dranse River valley with its numerous vineyards and orchards growing apricots. Keeping to the main road instead of forking left for Verbier is a little traumatic for me, but to get to Italy I’ve no choice. The road goes up the right hand valley until we reach the terminus of the Saint Bernard Express train at Orsieres. It then climbs through tiny villages with half wooden buildings and window boxes with bright red flowers, past hydroelectric dams of azure glacier melt water until it enters an avalanche tunnel. 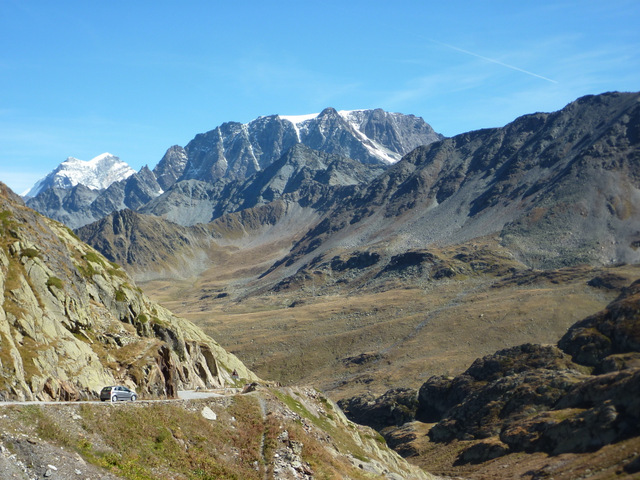 Then after a couple of kilometres the road forks into the Saint Bernard Tunnel or right to the pass. After half a kilometre you could be on the on a pass in Welsh, Snowdonia. But the snowcapped mountains behind remind us that we are in the Alps as this is September. Another strong clue was ice in the shadows under the large rocks at 11 am. Eventually the summit is reached at the Hospice. Here a sign informs all that the altitude is 2473 m or 8114 feet. 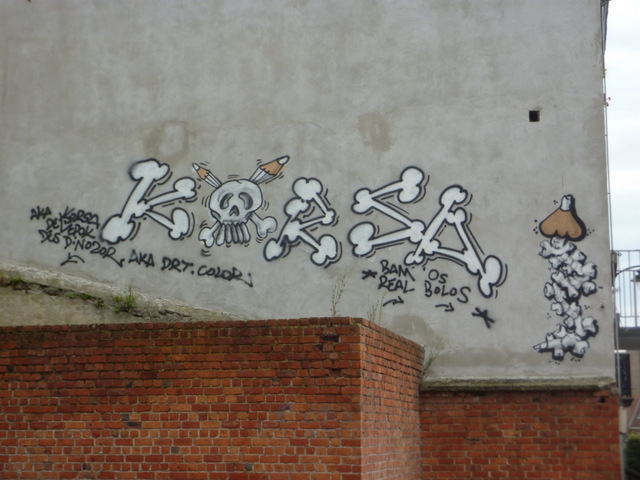 There are also signs recording how Napoleon took an army of 46292 men in May 1800 on his way to attack the Austrians who were besieging French held Genoa. But over the millennia many armies have used the pass. It is believed that the pass has been an important crossing point since the Bronze Age. It is possible to make out the old Roman Road from the current road on the climb. The hospice for travellers was set up by Saint Bernard of Menthon in 1049. The pass has carried his name since the 16 th century. St Bernard’s concern in the first instance was to make the pass safe from bandits for travellers. From this initial role they moved on to providing a rescue service. To this end the Saint Bernard dog was bred large enough to cross deep snow and locate missing persons. The story of them carrying brandy is a myth. 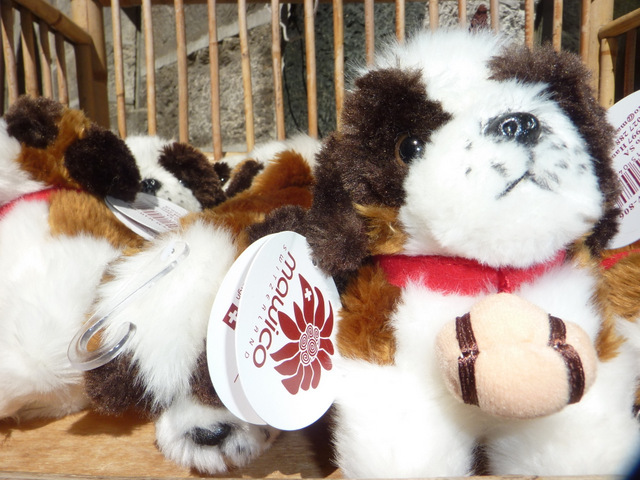 Saint Bernard was made Patron Saint of the Alps in 1923 by Pope Pius XI. 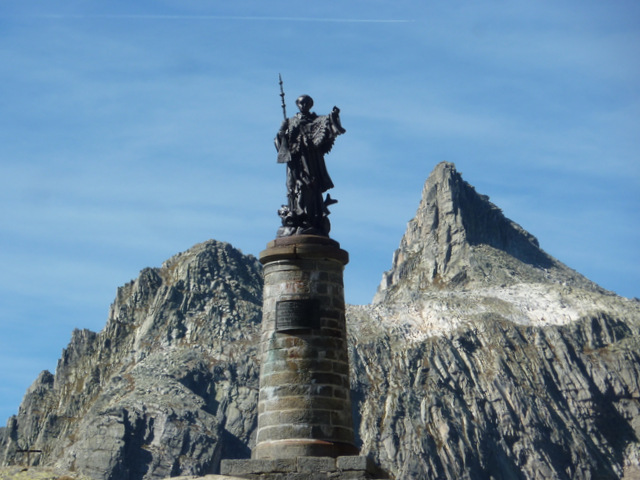 A statue of Saint Bernard can be viewed below the summit of the pass on Italian territory. It is built on the site of old Roman ruins. 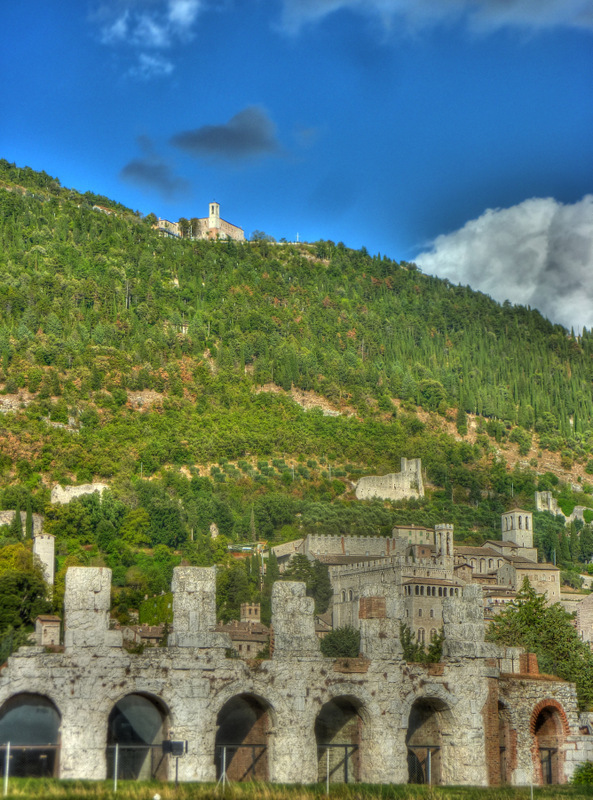 Gubbio was one of the visits on my recent vacation this September, in Umbria, Italy. It was recommended by Rebecca, the kind provider of our prize in the 2011 Passports with purpose competition. When I asked for typical Umbrian towns and villages to visit for a short hike, this was one of her selections. Then she said there was a gondola type lift where you stood inside a cage to take you up the mountain, I just had to go there! We did end up hiking to the Basilica of St. Ubaldo on skyline in this photo. One of my friends even came down using the lift. For a number of reasons, that I will not bore you with, we hiked down again. Then spent the best part of the day exploring the town before heading to the old Roman Theatre where I took this HDR photo with a Panasonic TZ6 set to autobracket at -1, 0, +1 and then processed in Photomatix Essentials. Our prize in the Passports with purpose competition was a week’s stay at Brigolante Guest Apartments which was a couple of hours drive through some breathtaking countryside. You can also compare accommodation prices for Gubbio in LateRooms*. The nearest train station is Fossato di Vico at about 20 km away. A bus service connects Gubbio to the station. There is also a bus from Perugia to Gubbio. Nearest airport is Perugia. Today is #BeachThursday on Twitter. This was started a long time ago in social media terms, by Isabelle Kenis of Isabelle’s Travel Guide to share favourite beaches. 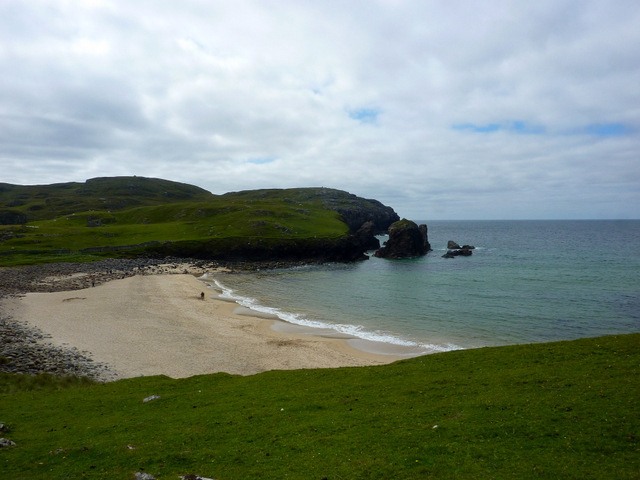 This beach is one of many deserted beaches to be found on the Isle of Lewis in Scotland’s Western Isles. It is located between Shawbost and Carloway. This beach was less than an hours walk from a house I rented for a week in Shawbost. When I tried to book a house from the owner’s listed in the accommodation guides for the islands I found that I’d left it too late for a peak week at the end of July. However, one of the accommodation owners told me that although they were fully booked, if I rang another owner not listed, then she might just have availability. She did and as a result I enjoyed one of the best week’s vacation of my life. No phone, no internet and the only GSM signal was O2 so couldn’t use that either. The only place where I could connect to the internet or get a 3G signal was at Stornoway. The next beach over to the South is also a surfing Mecca. That is one for another Thursday. Have you visited the Isle of Lewis? Do you have any tips for the area? The harbour at Portree on Scotland’s Isle of Skye. The Trotternish Peninsula on the Isle of Skye is an awe-inspiring landscape of rocks breaking out of verdant hills. 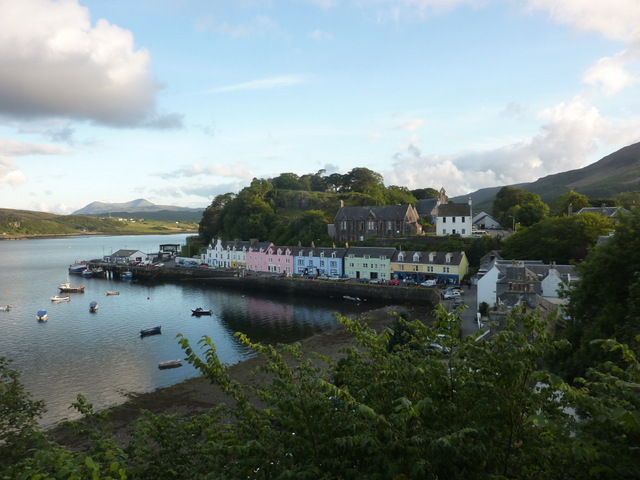 If you are looking for a touring base for the area, then Portree is a good choice. The capital of Skye it has an ample supply of hotels, restaurants and shops. Train to Kyle of Lochalsh then bus to Portree. 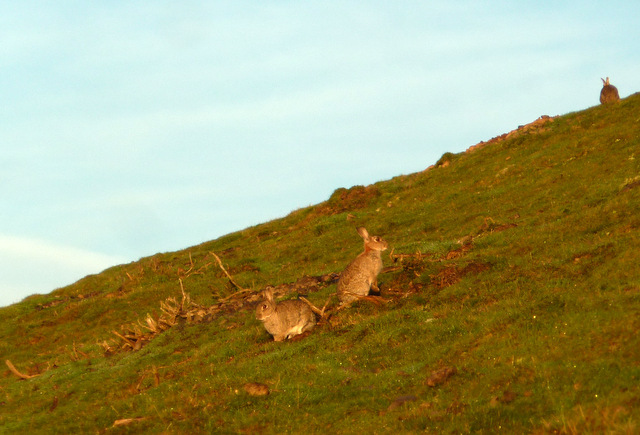 A companion post to Sunrise from a Welsh Castle on the VisitBritain SuperBlog. Look it up for more photos of misty valleys at sunrise. The sun sinking in a blaze of red skies is the first clue. The second is hints of frost on the windows the next day. This is the cue to get climbing above the Vale of Llangollen, for a sight that has to be witnessed to be appreciated. The previous day’s sun has warmed the valley and pulled some moisture from the River Dee into the air. As it cooled overnight the this air became thick with mist filling the U shaped valley formed by a glacier in the last Ice Age. 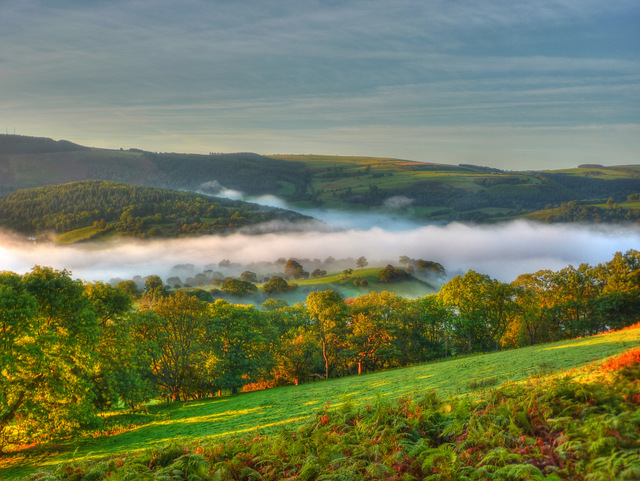 Climb up high above the valley and the river of mist lit by the orange rays of the rising sun and just marvel at nature and the science of mist formation. Before I sink like a Led Zeppelin. Here is the Misty Mountain Hop. There are two types of link on Eurapart. Normal and Affiliate. Take a seat Mr Bond! A photo for #FriFotos on Twitter, Friday 19 October 2012. 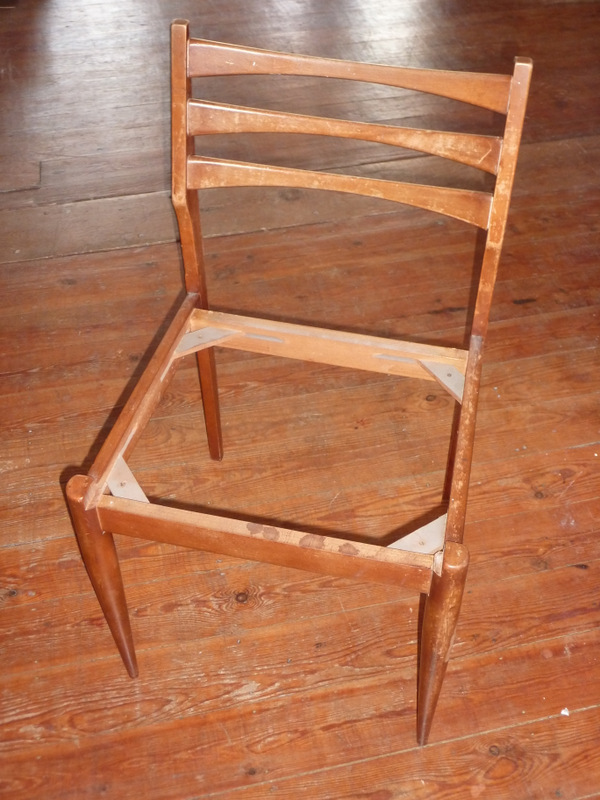 To take part just get your photos on the theme of ‘Chairs’ and share with the #FriFotos hashtag. This in addition to regular hosts Jonathan Epstein (@EpsteinTravels), Stephanie Diehl (@TravelDesigned) and Charles Yap (@CharlesYap); this week’s guest co-hosts are:Carrie Finley-Bajak (@CruiseBuzz) and Maria Laborde (@latinAbroad).